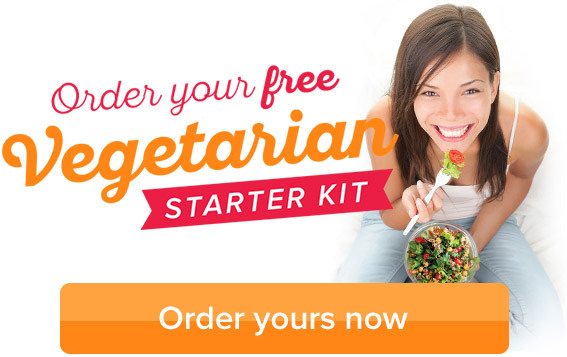 How to eat deliciously dairy free! 1 in 6 Australians are choosing dairy-free food, and more and more delicious dairy-free choices are appearing on supermarket shelves every day. Here are some of our favourite dairy-free choices. We recommend trying a few to find out what you like best. 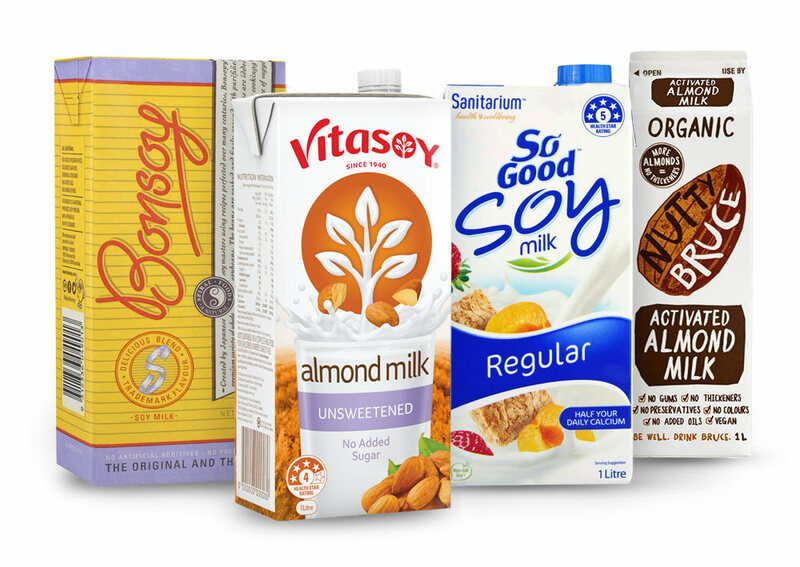 Soy mik, almond milk, rice milk, oat milk, coconut milk — most supermarkets stock a range of calcium-rich, plant-based milks, and every one is different so try a few and find what you like best. Some brands even have chocolate, vanilla and coffee flavoured milks. Our top picks are Bonsoy, Vitasoy, Califia Farms, Milk Lab, Nutty Bruce and Pure Harvest. Find them in the long-life milk section, and also in the refridgerated section at Coles, Woolworths and some independent supermarkets. As with dairy free milk, dairy free cheese products vary in taste among brands, but whether you like cheddar, mozzarella, Red Leicester or cream cheese you'll find one to your liking. 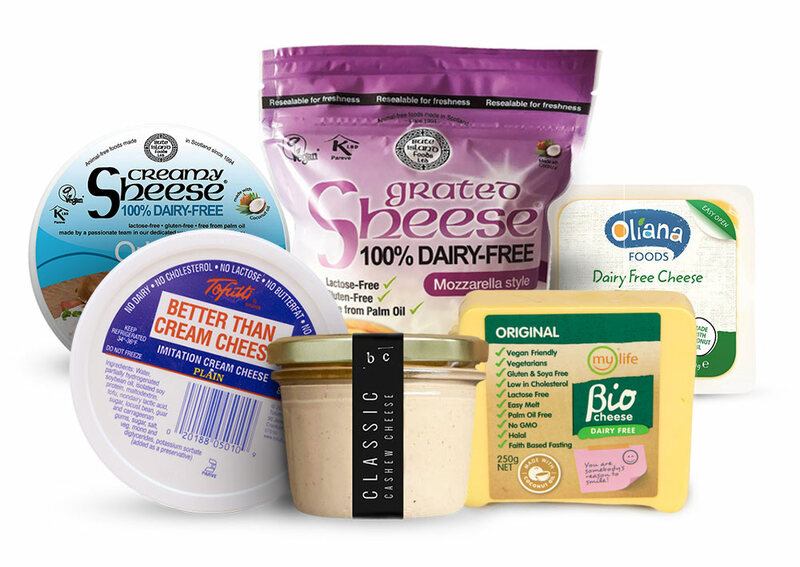 For a mild 'all-rounder' dairy free cheese, you can find BioCheese shreds and blocks at a wide range of supermarkets, including Coles and Woolworths. Also try the Sheese range, including cheddar, cream cheese, mozzarella shreds and Red Leicester slices, available at Woolworths. For a cheese and cracker craving, Woolworths stocks Culinary Choice dairy free cheese and crackers, as well as their hot peppers and tomato and basil flavoured dairy free cheese blocks. You can also find Tofutti, Oliana, YAY Foods, Botannical Cuisine, Vegusto, Hello Friend Foods and many more brands of dairy-free cheese at various supermarkets and speciality stores. 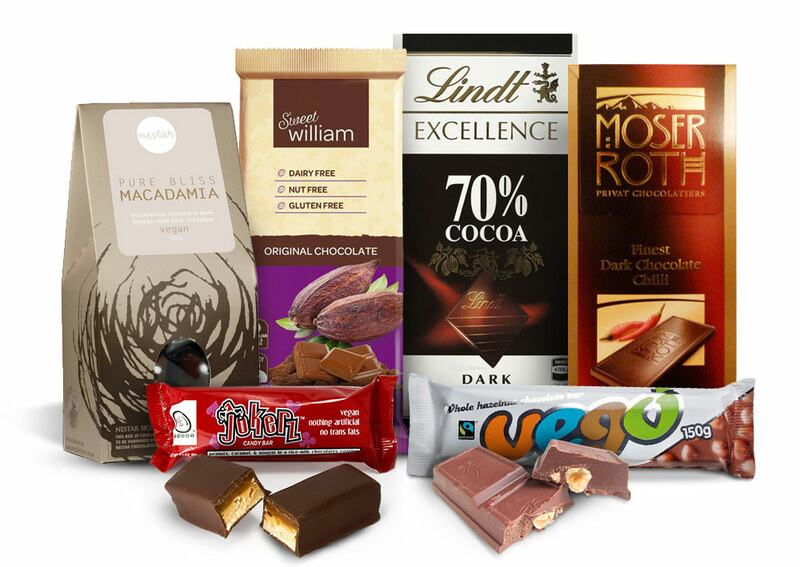 A lot of dark chocolate is dairy free, such as Whittaker's Dark and Lindt 70% and higher. Supermarkets also stock Sweet William dairy free blocks, bars and cooking pieces in white and 'milk' chocolate (in the 'health' food aisle). Often in the same aisle are LEDA's dairy free chocolate biscuits and mint slices. ALDI stocks the delicious Moser Roth dark chocolate range in a variety of flavours. And in some independent supermarkets, as well as health, wholefood or vegan specialty stores you can find Vego Bar's (similar tasting to Toblerone), Nestar dark chocolate coated nuts and dried fruits and GoMaxGo, providing the mouth-watering dairy free versions of popular chocolate bars. 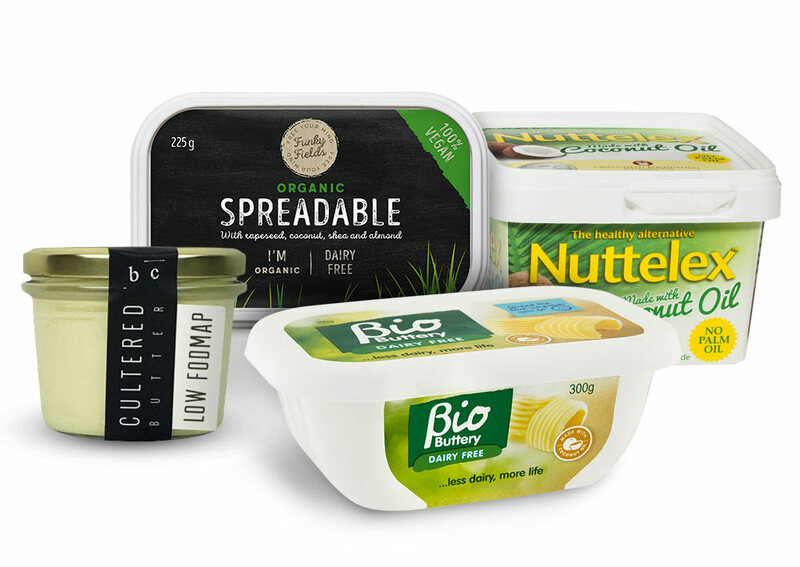 You can't go wrong with Bio Buttery, Nuttelex or Funky Fields spread for your toast or in your cooking. They look like margarine but have a buttery taste. If you can get your hands on it from a health food or specialty store, Botannical Cuisine butter is delicious. 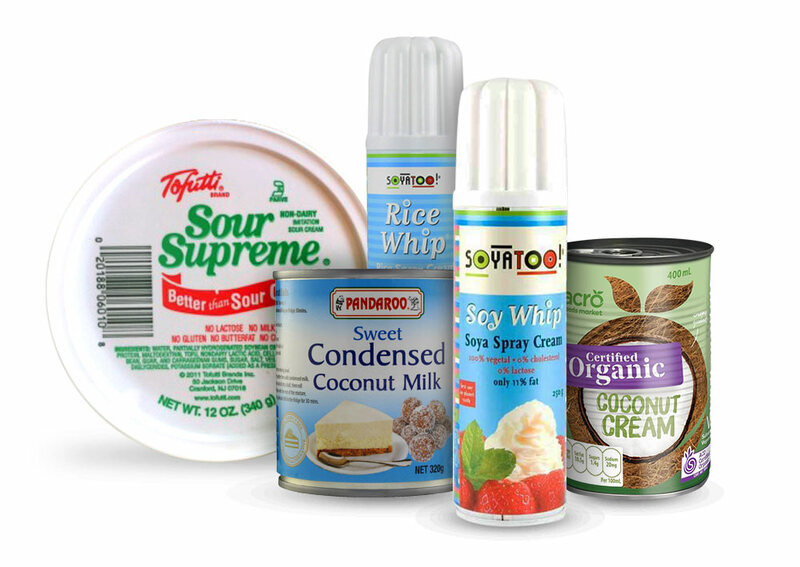 For dairy free cream, we suggest Soyatoo cooking or whipped cream in soy and rice options. For sour cream, try Tofutti's Sour Supreme. Coconut cream or milk can add richness and flavour to dishes like laksa and curries, and a dollop of coconut cream that's been chilled in the fridge makes a delicious topping for cakes, scones, pies and tarts. You can also buy a sweet coconut condensed milk at Woolworths. 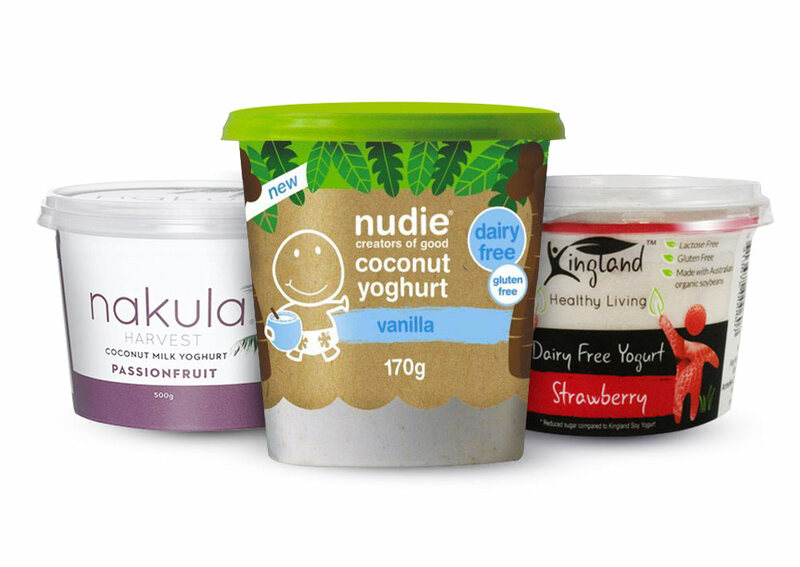 For dairy free yoghurt, try Nakula, Nudie and COYO coconut yoghurts, and Kingland or Soy Life soy yoghurts. They come in a variety of flavours and can be found in the yoghurt section at most supermarkets. Kingland also make a great dairy free Greek Style Yoghurt, sold at Coles and specialty supermarkets. For delicious dairy free ice cream, you can't go past the Ben and Jerry's dairy free range and Over the Moo coconut ice creams. You'll also find So Good dairy free ice creams, and Weiss sorbets in most supermarkets. Most sorbets at ice cream stores and gelaterias are dairy free as well. 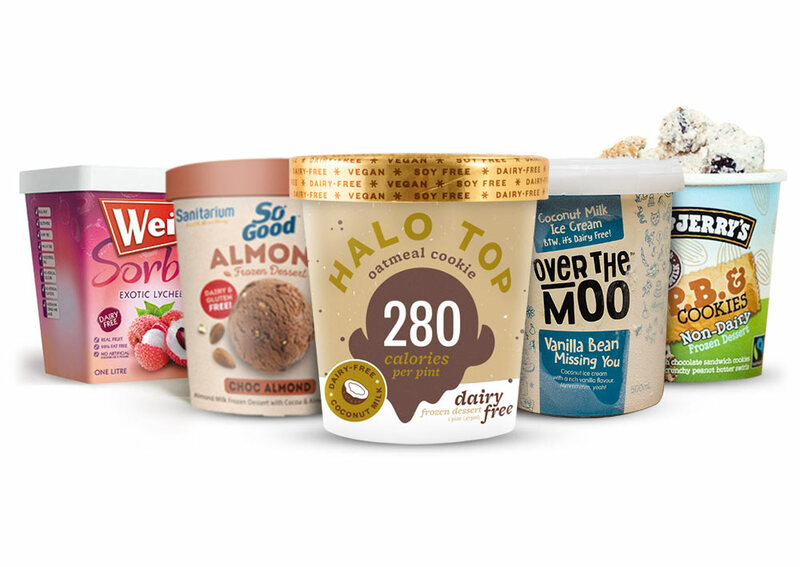 For a low calorie option, Halo Top's dairy free ice creams are available at Woolworths. If you have trouble finding items like dairy free cheese or dairy free chocolate in your local supermarket, ask at the counter or try checking in organic or wholefood stores. Or you could order everything without even leaving your computer from stores like Everything Vegan Online, Vegan Perfection or The Cruelty Free Shop! Each year hundreds of thousands of bobby calves across Australia are discarded as 'waste products' of the dairy industry. 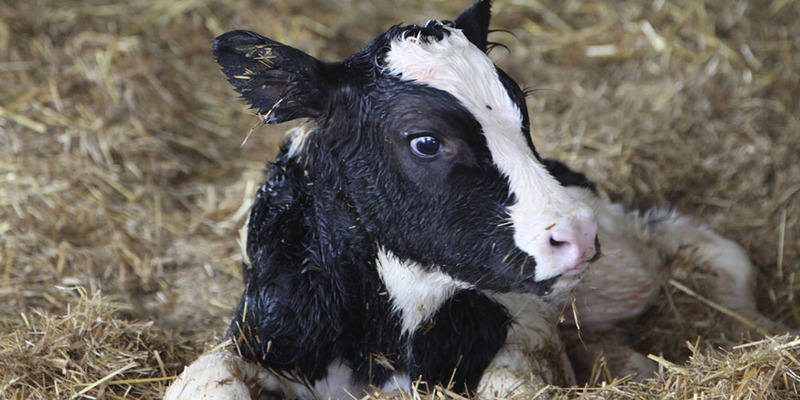 Born only to keep their mothers producing milk, they are sent to slaughter within days of being born — so that their mother's milk can be bottled for humans. Want to enjoy even more delicious animal-friendly meals?